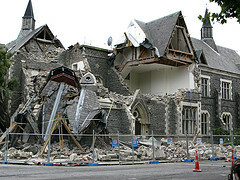 Yesterday Christchurch was hit by a devastating earthquake. Our thoughts go out to family and friends and everyone down there. RimuHosting is nestled safe in Cambridge far away from the earthquake. We feel far removed and frankly a little frustrated at our inability to do much to help our fellow kiwis. What we do have, and what I would like to offer to those affected, are VPSs. For mail. To help keep your business ticking over. To provide updates to your friends and family. To provide forums and support groups for those affected. For mash up apps that help match up people who can help with people who need help. So if you are affected by the quake, or think you can help, then contact us at http://launchtime.ri.mu/support/feedback.jsp . Tell us how you are affected or how we can help and we should be able to do things like provide some hosting for no cost for a month or two while things settle. This entry was posted in Rimuhosting and tagged christchurch, earthquake, eqnz, linux. Bookmark the permalink.